Canadians are tough guys. With begin of the calendar spring they switch to spring clothes  regardless of the weather. It has 4° C, sleet and humans feeling like me wear boots, warm jackets, caps and gloves. The other fraction that already received summer command goes round with shorts and sandals without socks on its feet. I pull my scarf tight around my neck and dont understand anything any more. The harbour appears a bit homespun; I cant spot more than three employees. 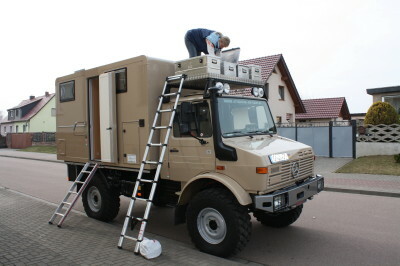 All of them are very helpful, everybody knows, we want to fetch our Unimog, and asks where the journey will take us. A great joy: a couple of minutes later we can drive off with an externally undamaged Arminius. The fright follows later on inspecting the interior cabin. The customs didnt handle our belongings what you would call squeamish. The storage compartments had been partially loaded with care and considerably full. Since the officers just had thrown back the content wildly, not everything fitted in again. They had distributed the rest evenly onto bed and worktop. They had ripped the soft case of the old laptop that we already had packed into the car when opening or closing the drawer with too much screw. They had ruthlessly opened the storage compartment lids and had teared the bed sheets that should protect our mattresses. Particularly annoying because custom made special sizes arent that cheap. However, they didnt find anything of interest. Everything was there, nothing was missing, and we got our customs papers without problems. Who knows what had provoked them; perhaps the locked cabin, maybe the military four-wheel driver, perhaps it just had been a bad day. The invitation of Ian and Clair has saved our day. The two English live in Nova Scotia at present and had contacted us via e-mail in advance after discovering our webpage on the internet. Ian picks us up at the hotel, takes us to the harbour, to his home, and goes shopping with us. Claire let us use their internet connection, their washing machine, their tumble dryer. We may stand for two nights in their driveway; we can sort us and clear away the customs chaos. A world trip could not start more pleasant than with an invitation already for the first nights. This gives reason for hope! Thank you Claire and Ian! We wont get Arminius today. The customs want to check the living cabin and need the key. Until they would be able to return the key it is past 12 oclock a.m. And that is too late to pick up the car from the harbour. No, it isnt usual to hand over the key to someone in advance, the kind lady from the haulage company in Halifax assures us. This was an unavoidable delay. Back to the hotel, book another night. Suppress frustration. Hope that tomorrow everything works out. Most Canadians react irritated to my question for a SIM card for my mobile phone. The secret is disclosed a bit later in the agency of Canadas largest mobile communications provider: They do not sell SIM cards, just pre-programmed mobile phones. But I dont want to buy a new mobile, Ive got one! Luckily there are competitors in Canada. They carry SIM cards as well. Acting dumb for five minutes is sufficient for your whole life is a German saying. In Canada just sitting and watching for maximum 30 seconds is more than enough to get help from a local. In front of the coffee shelves in the grocery I cant take a decision. Immediately I get help: not only which brand to take but the sort as well. Its on special offer at the same time, a bargain. I stand indecisively in front of a sandwich bars long menu as a natty man in his mid-thirties advises me: I always take the days special, thats my favourite. A good bet. We quickly want to check the city map for the right direction as we are asked where we want to go. And of course we were given directions. Are all Canadians that nice? Dear René, German sports cars with a P at the outset dont go faster than other cars during Londons rush hour. The evaluation of Mondays the rush-hour traffic was quite optimistic. The trip to the Heathrow airport took three times as long as planned. Anyway, the Air Canada check-in counter was not expected to close one hour prior to departure. The flight would leave 10:05 a.m. and it was 9:13 a.m. Fortunately there are other flights. Toronto for instance is a nice city as well, and it is located in Canada into the bargain. From there it is not too far to Halifax, just two hours by plane. Air Canada was nice enough to rebook our tickets. Instead of arriving at lunch time we reached Halifax at 8 p.m. But I cant think of better things to do than spending my time on aeroplanes. Theres nothing like food on aluminium platters and red wine in plastic cups. Info: Transfer from Halifax airport to the city (hotels, harbour) with the Airporter shuttle bus (nearly every hour) 21 c$ per passenger. Taxi 53 c$ (plus tip). The Whitney Houston concert in Londons O2 Arena is nearly sold out that evening and starts for us with commotion. The tickets that we were fixed up with are for the concert the next day. The marshals there are nice enough not to evict us. We just have to exchange our seats in front of the stage to seats with a side view. Whitney has got a cough. And not only that, she has got a bulk of other problems. The first costumes t-shirt is too short, the second ones dress is too long, and she has permanently to twitch her clothes which are too tight  but those are her minor problems. Whitney cant sing, what is quite disadvantageous to a singer. Therefore she avoids that during the concert. She chats a lot, she delights us with speech songs, but the opulent background choir ladies have pretty voices. Whitneys voice is husky, shes got a cough. The tablets she takes in the meantime just help terminally. When she tries to sing she doesnt strike the right note, the higher pitches became unattainable. She just sings the first notes of her former hits, some of them were modified to the limited pitch range of a voice damaged by drugs. She handles her problem charmingly. I want, but my voice doesnt, she jokes. Most fans sympathize, but not all of them listen to the very end of the concert. Altogether 170 US$ entrance fee per person and 40 US$ parking fee are pretty expensive for a dubious pleasure. Finally we started this evening as well. A short flight took us to London. The stopover does not only have an advantage with regard to the ticket price; we took the opportunity to visit our old friend René whom we didnt see for many years, and his wife Sabine. They own the Bavarian Beerhouse in London (www.bavarian-beerhouse.com). Large, noisy, and astounding Bavarian. You can find Bavarian veal sausage, Leberkaese, a kind of meat loaf, German girls with short dirndl dresses and beer in a stein Masskrug that contains two pints instead of one litre. But more is never bad, is it? The trip has started. At least for one of the three of us. Arminius is since April 8th on the ferry to Canada. From Hamburg it takes three long weeks until we can take receipt of him in Halifax. In either case we will do better with Gods blessing. To avoid any harm happening to us Reverend Wolfgang Stengel came on the dot for our departure to Hamburg to say his benediction. Thank you, it could come in useful one day! Just as little Germanic Arminius, who conquered the big Romans in those days, now little Arminius hits the road to discover the world. At the motorhome parking space Hamburg close to the harbour Arminius is a bit out of the ordinary and attracts attention. After a night with versatile sounds  suburban railway, seagulls, and road  we delivered him for shipment where photographing was unfortunately forbidden. There are one thousand reasons for NOT setting out on a world trip. Too much work, too much stress, and too much property. Lack of time, lack of money, and lack of desire. Too many children, too much family, and too many friends. Lack of knowledge, lack of courage, and lack of interest. I do understand each single one. We met many of them during our preparations. But there are at least one million reasons to set out on a world trip. Being curious about nature, people, and cultures. Joie de vivre, spirit of adventure, risk awareness. Not least interest in our world. There is only one. A world trip isnt a pleasure excursion. There were difficult times already beforehand. Dreaming for years was replaced by hard work for one year and three months concrete preliminaries. Ten hours per day, from Mondays to Sundays. There were times where nothing seemed to work, everything broke down, nothing fitted, and frustration took over. Nobody seemed to intend insuring our car, but theres no way without. Unanticipated costs came towards us. A work accident delayed our departure, in the end it were fortunately only two weeks. But we never had doubts. And now, finally, we are ready to rock and roll! 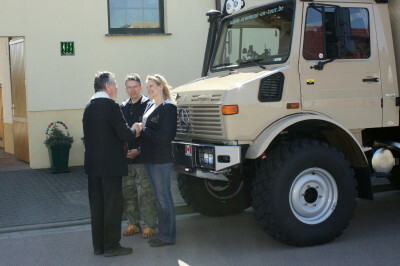 You are currently browsing the Blog English - Arminius-on-tour blog archives for April, 2010.